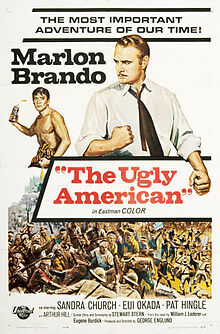 Brando, his matinee idol good looks already going to seed, ably portrays a US ambassador to a fictitious nation in Southeast Asia dangerously gripped by Communist influences. Unmistakably based on the "situation" in Vietnam, Brando's patrician charisma initially wins the day, but revolutionary forces are brewing under American support of a US-friendly dictatorship. (The parallels between the real-life relations between JFK and Ngo Dinh Diem's regime must illuminate the film considerably.) In a heated discussion which dissolves into a drunken argument, Brando is faced with a more sympathetic Communist-sympathiser than perhaps yet seen so frankly in American movies. Unfortunately, however politically nuanced or liberal for its time - pleading for an end to paranoia and a diplomatic approach - it appears today to be on the wrong side of history. Brando's foil, a local politician favoured by the leftists, accuses the U.S. of imperialistic ulterior motives in its road-building campaign, arguing that it will be used for military purposes. Later, when Brando and his wife visit the road construction site, they discover a children's hospital kindly run by American benefactors. This misleading extenuation of American involvement in Southeast Asia seems pernicious in light of the millions of civilian dead in Vietnam, Laos and Cambodia only a decade later. All at once, the film is open-minded and allows for direct critique of U.S. foreign policy, deeply unusual for its time. It also portends an ahead-of-its-time cynicism about the general public and the importance of allowing space for debate without paranoia. In Brando's final rousing monologue, espousing understanding and peaceful diplomacy, the television screen back in its suburban American home is abruptly switched off, cutting him dead in the middle of a sentence. The Ugly American is, in many ways, too little, too late - a moderate version of leftism couched in anti-Communism to the core, one that fails to condemn U.S. intervention abroad - but also all too aware that its message of diplomacy would largely be ignored. On these grounds, violence would be the only remaining response. How a film so of-its-time (1963, a year of turmoil at home and abroad -) could be so utterly wrong and so utterly right simultaneously is really quite disconcerting.